My last post on poet Frank Stanford (I just typed in “Frank Suicide,” which shows you where my head is) was overly long for a blog entry, so I cut myself off before I finished exploring his life. I’ll finish today and hopefully will put him and his dark charms behind me because this guy has a grip on me. No wonder he’s a cult figure. Not only is his poetry arresting and fresh even 33 years after his death, his life is just waiting for a movie script. I can’t say that I would have liked him—a guy whose idea of party fun is to point at each person in a circle saying, “I like you,” and “I don’t like you,” is someone I would avoid. But I feel the pull. The restless energy behind his good looks comes through in the few available photographs of him. Stanford was “handsome as the sun,” poet C.D. Wright said of him. Poet (and Stanford mentor) Miller Williams said he looked like a young Charlton Heston. And Stanford’s friend novelist Ellen Gilchrist has said that to know him was to understand how Jesus got his followers. Actually, the lives surrounding Stanford fascinate me as much as his own, and those are the lives I’m going to write about today. Stanford’s suicide was precipitated by a confrontation with his wife, painter Ginny Stanford (Crouch) and his lover, poet C.D. Wright. He lived with Wright even as he visited his wife every week, promising they’d get back together. After an argument with Crouch and possibly with Wright (she was in the house but it’s unclear to me whether she was part of the fight), Stanford walked back into his bedroom, closed the door, unbuttoned his shirt and shot himself three times in the heart. Stanford’s philandering is not to his credit, but the type of women he pursued is. Unlike another notorious womanizer, Tiger Williams, he seems to have liked the company of equals, artists and creative types. 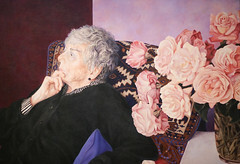 His wife Ginny Crouch, an Arkansas native as was he, is a painter of note. 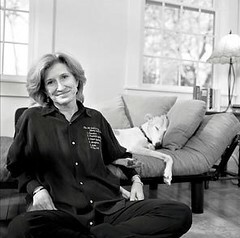 She painted the official portrait of another one-time Arkansas resident, Hillary Clinton, and several of one of my favorite writers, M.F.K. Fisher. 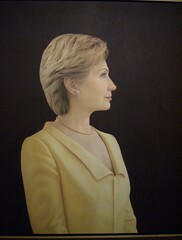 Clinton’s portrait hangs in the National Portrait Gallery and Fisher’s in the Smithsonian. Crouch has also illustrated book covers for writer Ellen Gilchrist, a close friend of Frank Stanford’s and someone he mentored. Gilchrist has written extensively about a character who strongly resembles Stanford. Lucinda Williams, Ginny Stanford, C.D. Wright, Ellen Gilchrist—these women’s careers have outlasted Stanford’s, and dare I say outshined it. At least for the moment. A biography, a re-issue of his books, more work printed in anthologies, and hopefully a movie someday will give him the cultural presence he deserves. Meanwhile he waits in relative obscurity to be resurrected as the women in his life continue creating.